Republican vice presidential nominee Paul Ryan slammed President Barack Obama for the Auto Task Force’s treatment of nonunion workers who saw their pensions slashed by 70 percent, while their union coworkers lost no funds thanks to a $1 billion "top-off" by GM, during a rally in Sabina, Ohio, on Saturday. "The president likes to go around Ohio talking about how he saved the auto industry, how the auto bailout was such a success. Tell you what: He hasn't talked to these Oak Creek salaried employees, he hasn't talked to these Ohio Delphi salaried employees, because this is one of those examples of the government picking winners and losers," Ryan said. Ryan took the stage after personally meeting with nine Delphi retirees. One of those retirees was Dayton resident Tom Rose, who spent 39 years with GM and Delphi as an engineer; it would have been an even 40 had he not taken a break to serve in Vietnam in 1971. Rose has seen his healthcare costs triple after losing his company medical coverage. He shared his story with Ryan in a 30-minute meeting held before the Sabina speech. "What we tried to convey was extreme frustration we feel with all of the delays from the administration; he committed to helping fix this issue, to get information about what really happened," he said, adding, "to have 30 minutes with a vice presidential candidate 10 days before the election was an honor." There are few members of Congress more familiar with Delphi’s plight than Rep. Ryan (R., Wisc.). The company shuttered two factories in his Wisconsin district during its five-year bankruptcy, which ended with the auto bailout in 2010. Ryan also serves on the House Ways and Means committee, which is investigating the Treasury Department’s role in the decision to reduce nonunion pensions. "Paul Ryan has a record in Congress on this issue, questioning [Treasury Secretary Tim] Geithner and trying to get the documents released from the administration," said Rep. Michael Turner (R., Ohio), who attended the meeting with Ryan. "Documents are being released, and as they’re released, they’re substantiating what we’ve said all along: This was a political decision." Delphi was an important element of the auto-bailout. The company, one of GM’s largest parts suppliers, had been in bankruptcy since 2005 and Treasury officials recognized that it would need to be lifted from bankruptcy along with GM. To cut costs, the Pension Benefit Guaranty Corporation (PBGC), an independent federal insurer of retirement systems, terminated the nonunion plan while GM volunteered $1 billion to top-off pensions belonging to the United Autoworkers union. The administration has contended that GM was acting on a 1999 agreement with the union to close any pension gap that emerged if Delphi declared bankruptcy. That agreement, however, was liquidated when GM itself entered bankruptcy and emerged as a new company, according to bankruptcy expert Todd Zywicki. "General Motors' decision to guarantee the obligations of a separate company—Delphi—was completely unjustified under established principles of bankruptcy law, and it increased the cost of the taxpayer bailout of the automotive industry by more than $1 billion with no reciprocal benefit to General Motors," he told Congress in July. Four congressional committees are investigating whether Treasury officials attempted to influence the PBGC’s decision. Emails released from the PBGC demonstrate that officials from the Obama administration were in contact with the apolitical insurer before the decision was made to slash nonunion benefits. While the PBGC has submitted more than 60,000 pages of documents to the committees, the White House and Treasury Department have refused to release their documents. 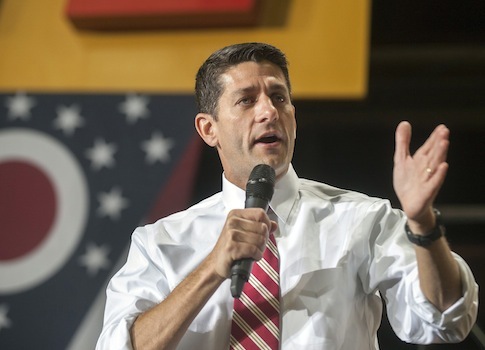 Obama campaign spokesman Danny Kanner attacked Ryan for highlighting the misfortune of the retirees on the stump. "Congressman Ryan is trying to rewrite history. The fact is that when the American auto industry and its workers were on their knees, Mitt Romney turned his back," he told CBS News. Rep. Turner, whose district has seen a Delphi plant close and has led the charge on Capitol Hill to investigate the PBGC’s decision, said Kanner overestimates Obama’s automotive legacy. Ryan’s comments came just three days after Republican House Speaker John Boehner called on the president to cooperate with four committee investigations into the Delphi scandal. "The president’s description of the effects of the auto bailout is fantasy. The jobs aren’t here in southwestern Ohio, they’re in China," Ryan said. "We’re going to look back at this bailout and say the president didn’t know what he was doing with billions of taxpayer dollars." Den Black, a 30-year veteran of Delphi and GM who now leads the Delphi Salaried Retiree Association’s legal battle to reclaim the lost pensions, said Ryan's speech could provide the Romney campaign a needed boost in the battleground state that could decide the election. "We’ve been advocating some light be shed on all the things the Obama administration doesn’t care to mention about the bailout and we’re glad that Rep. Ryan brought up the Delphi salaried pension theft scandal," he said. "The people chosen as losers in the bailout are solidly middle class. They’re showing that Obama only champions the middle class that is on his side." This entry was posted in Politics and tagged Delphi, General Motors, Michael Turner, Obama Administration, Paul Ryan, Pension. Bookmark the permalink.